The Eurasian wren (Troglodytes troglodytes) is one of 88 species of wren and the only species found outside of north America. In common with the wren we know and love in the UK, wrens in general are rather small and inconspicuous birds with an explosive complex song, that rings out when you least expect it (per unit weight, the Eurasian wren reportedly sings at ten times the power of a crowing cockerel). Many wren’s wings are barred and they often have that upright tail that is so characteristic. They are primarily insectivorous but some wrens do eat seeds and berries, and can take lizards and frogs (small ones that is). The Eurasian wren has even been recorded wading into shallow water to catch small fish and tadpoles, and it is thought that they may follow badgers around, to take advantage of prey that is disturbed by the badger. The family name ‘Troglodytidae’ is derived from ‘troglodyte’, meaning “cave-dweller” – this stems from the tendency of some species to forage in dark crevices, or may refer to their delicately constructed nests, which have only a small opening. The Eurasian wren is among the smallest birds in its range, while the smaller species from the Americas are reportedly among the smallest passerines in that part of the world. 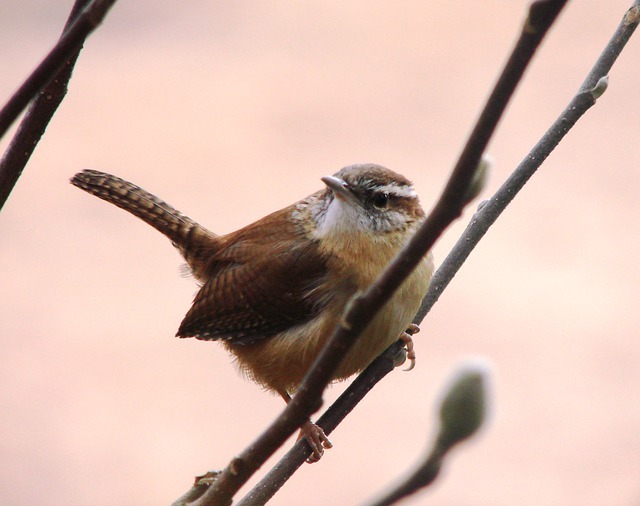 They range in size from the white-bellied wren, which averages under 10cm (3.9in) and 9g (0.32oz), to the giant wren, which averages about 22cm (8.7in) and weighs almost 50g (1.8oz). Visually, there is little difference between adult and juvenile wrens, and the majority of the family are brown, grey, black and white in coloration. They occur in a wide range of habitats, from dry, sparsely wooded country to rainforest, with most species found at low levels. In addition, the majority of species are resident; however, a small number of wrens are partially migratory. Temperate species generally occur in pairs, but some tropical species may occur in groups of up to 20 birds. 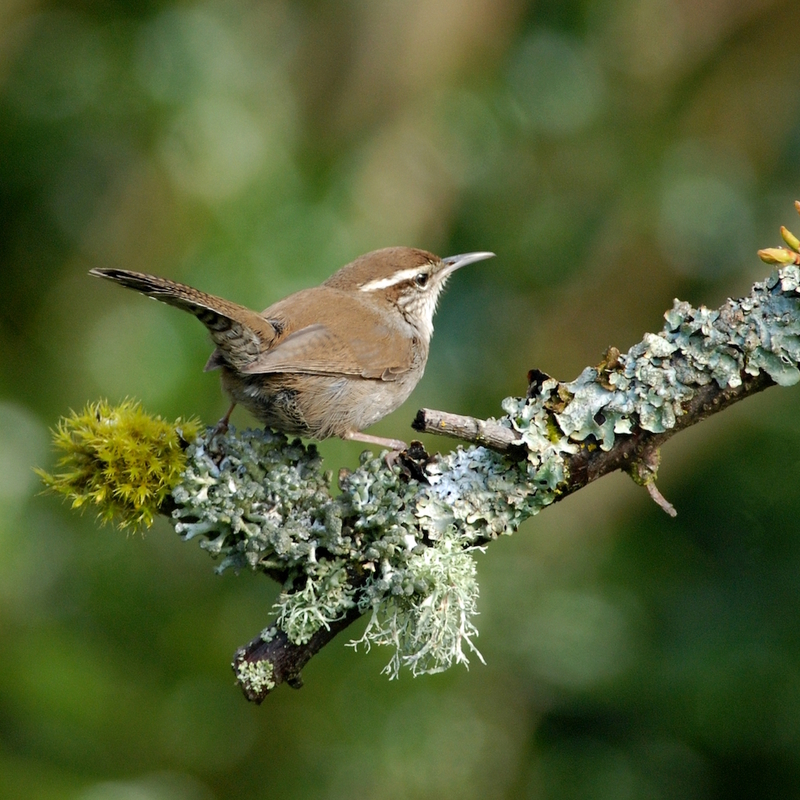 There are six known subspecies of wren from Britain and Ireland, four of which are island races, found on Shetland (zetlandicus), Fair Isle (fridariensis), St Kilda (hirtensis) and the Outer Hebrides (hebridensis). A fifth indigenous species is found across the northern and western mainland, intergrading with a sixth, troglodytes, in the south-east of England. In appearance, the upper parts and flanks have dark barring and the pale eyebrow (supercilium) is prominent. The underparts are paler with grey barring. The bill is brownish and the legs are flesh-brown/pink. An adult wren will weigh about the same as a £1 coin, with only the firecrest and goldcrest being smaller species found in Britain. 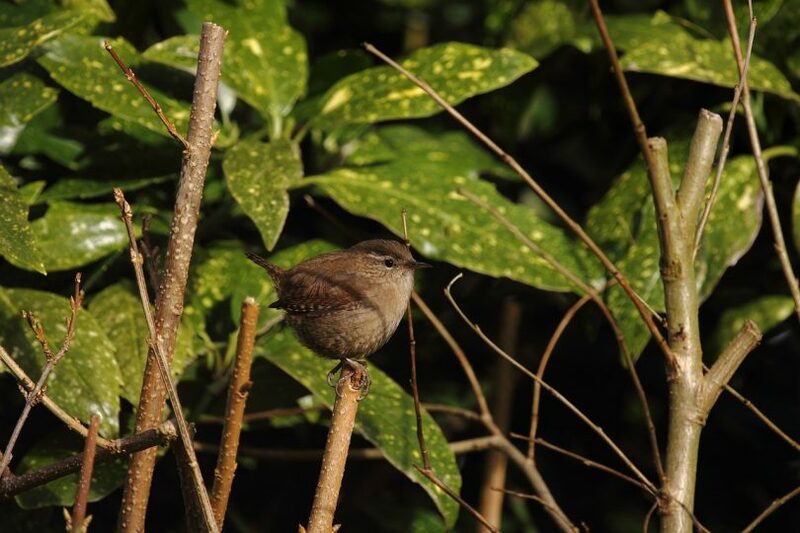 The wren is typically associated with a wide range of habitats – woodland, farmland, heathland, urban and suburban habitat, and can be seen year round exploring shady, overgrown places on or near the ground, for small insects and spiders. During the breeding season, males make several nests from which the female chooses one in which to lay her eggs. The wren lays between one and nine eggs, which only the female incubates, although both adults will feed the young chicks. Wrens are highly polygamous; a male can have more than one female with an active nest at any one time in his territory. In fact, there was one recorded instance of a male wren that had partnered with four females in a single territory. Most British wrens are sedentary although some move up to 250km (150 miles) into more sheltered habitats for the winter. 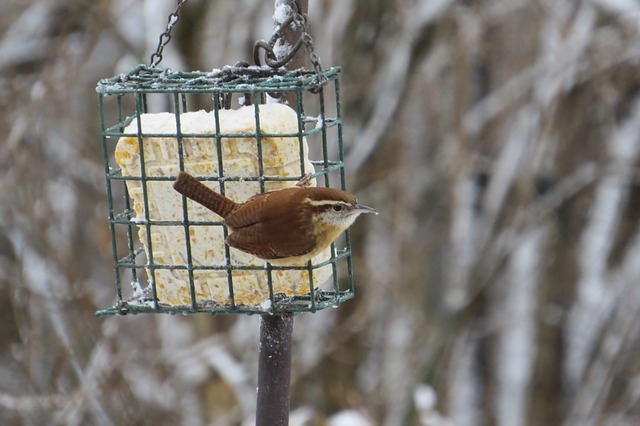 Wrens will nest communally in winter, with as many as 10 birds spending the night together in a single nest box. The maximum recorded roosting together is 60. The wren is surprisingly prevalent in folklore. Killing a wren or harassing its nest is associated with bad luck – broken bones, lightning strikes on homes, injury to cattle. ‘Wren Day’, celebrated in parts of Ireland on St. Stephen’s Day (26 December), features a fake wren being paraded around town on a decorative pole (up to the 20th century, real birds were hunted for this purpose) – a possible origin for the tradition is revenge for the betrayal of Saint Stephen by a noisy wren when he was trying to hide from enemies in a bush; and, according to Greek legend, the wren became the king of birds by hiding on the eagle’s back, and thus succeeding in flying higher in the sky than the eagle…It appears that I am not alone in my fascination with this little bird.